Just want to use the opportunity and introduce myself here. My name is Anna Tide, I'm creating dolls under the name Serenity Kingdom. I'm living in Germany, but came here from Russia many years ago. So, I speak Russian, German and English. I'm 27 years old and create artdolls from 2006, but began to work hard with porcelain BJDs last year. I am also a teddy-bear artist and ABJD make-up artist. I make everything for my dolls by myself, inclusive sewing the clothes and always try to find something new I can add to the character creating process. Hello Anna! I just discovered your work last week and I was blown away! I can't believe the quality of your sculpting and paintwork. I hope you will start yourself a Discussion thread and that we will see so much more of you! I'm so glad you made it to the forum. Thank you, dear allurose ^___^ I'm working at my discussion tread right now ^__^ Thank you for inviting me at Flickr! Oh my gosh, your dolls are amazing! I'm so glad to discover your work! You are so welcome! 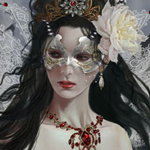 I couldn't not invite you after seeing your exquisite work! Again, I'm just so happy you are here. I discovered your dolls last week on ebay and I was blown away too by their quality . I'm usually not into child-looking dolls but yours definitely stands out. It's so nice to have you here. I hope we'll see a lot more of your work. Your dolls are gorgeous! Looking forward to seeing more! Dear Anna, I discovered your art a year ago when looking for make-up lessons for the dolls, and then gladly looked at the process of creating your perfect doll. What a talent, what a sculpture, what a painting - it is simply astounding! Your girls are so sweet, tender and touching - just amazing! 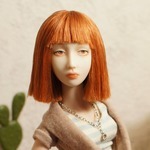 Classic porcelain dolls with a modern twist - I love your style. Have you ever thought of making bigger dolls as classic ones were taller or do you prefer smaller dolls? Thank you so much for all kind words you've found for my girls! It makes me so happy! I really spent a lot of time to get to this result... I have to learn so much before I feel that I'm ready for creating the dolls of my dream.